We've sent out a bunch of Toy2R 1.5" Mini Bombs to scores of artists- some well-known customizers but mostly a lot of new, fresh names! We are now totally out of Bombs. Because of the unexpectedly HUGE response to this online custom show, we reached out to Delicious Drips. DD is a much larger presence in the custom toy scene and they have agreed to co-sponsor this show! DD still has a stockpile of Mini Bombs to sell and they have generously volunteered to set up a coupon code to give you a chance to pick up your own Mini Bomb(s) from DD at a discount! The code whodabomb will get you $2 off your purchase of a Bomb from their online store. ANYONE & everyone is welcome to participate in this online custom show! All customs must be finished and submitted via email by August 31st to be included in the Who's Da Bomb show. Your finished custom may also be submitted to the Delicious Drips Submission site, which is a place where anyone can sign up and submit their custom toys to be viewed and voted on by the toy community! 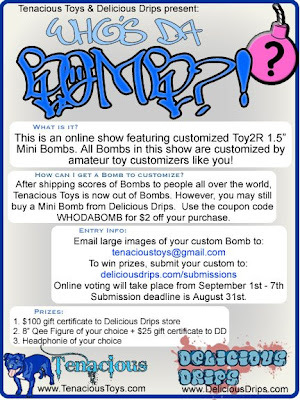 Voting on the custom Bombs will run from September 1st thru September 7th on the Delicious Drip site. And, at the suggestion of DrilOne, in September we may be putting together a book of some of the customs in the show which will be published a la carte by Blurb. Their smaller softcover 7" x 7" books are only $12.95 so it's a great low-cost way to see your custom toy published in print! You can still buy a Kozik Mini Bomb from Delicious Drips! However, if you'd still like to participate in the Who's da BOMB?! online custom show-off, you may go to the website of the co-sponsor of this project, Delicious Drips, and buy a blind-box Mini Bomb for yourself! They have generously volunteered to give interested parties a coupon code good for $2 off the purchase of a Bomb from their store. It should be noted that the Mini bombs are NOT toys and are NOT intended for children! We have had a number of requests from educators and parents looking for handouts for their kids. The Kozik Mini Bombs and all other "designer toys" are pieces of artwork. They are NOT meant to be played with, touched excessively with bare hands, or given to children. They have NOT been safety tested or rated for children in ANY WAY!